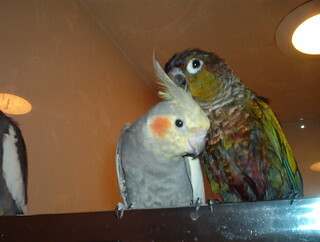 BirdTrude is the cockatiel, and West is a Green Cheek Conure. BirdTrude doesn't really like West but changes his mind when she starts cleaning his feathers for him. BirdTrude was sold to me as a Female, but you can see here that he is molting, and is actually a Male.